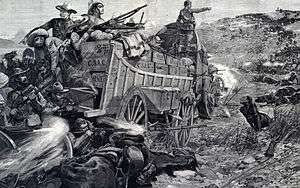 The First Matabele War was fought between 1893 and 1894 in the country today called Zimbabwe. It pitted the British South Africa Company against the Ndebele (Matabele) Kingdom. Lobengula, king of the Ndebele, had tried to avoid outright war with the company's pioneers because he and his advisors were mindful of the destructive power of European-produced weapons on traditional Matabele impis (units of Zulu warriors) attacking in massed ranks. 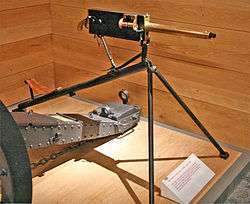 Lobengula had 80,000 spearmen and 20,000 riflemen, armed with nine-pound Martini-Henrys, which were modern arms at that time. However, poor training meant that these were not used effectively. The British South Africa Company had no more than 750 troops in the British South Africa Company's Police, with an undetermined number of possible colonial volunteers and an additional 700 Tswana (Bechuana) allies. Cecil Rhodes, who was Prime Minister of the Cape Colony and Leander Starr Jameson, the Administrator of Mashonaland also tried to avoid war to prevent loss of confidence in the future of the territory. Matters came to a head when Lobengula approved a raid to forcibly extract tribute from a Mashona chief in the district of the town of Fort Victoria, which inevitably led to a clash with the Company. Throughout 1891 and 1892, Lobengula ensured that his raiding parties were directed away from their main target areas of Mashonaland and so precluded possible clashes between his zealous young commanders and the white settlers. However, in 1893, a chief in the Victoria district named Gomara refused tribute, asserting that he was now under the protection of the laws of the settlers. In order to save face, Lobengula was impelled to send a raiding party of several thousand warriors to bring his vassal to heel. The raiding party destroyed several villages and murdered many of the inhabitants. (In this they were more restrained than usual as they generally abducted the suitably aged young men and women and killed everyone else.) However, the local British South Africa Company administration felt that they had to intervene to avoid losing the confidence of the local people who complained that they were not being given any support against the raid. As a result the Company officials demanded from the raiders that they leave immediately. 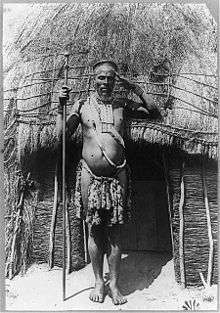 The Ndebele refused and in the hostilities that developed the Ndebele sustained an unknown number of casualties; this led to their withdrawal. A week later, on 1 November, 2,000 Matabele riflemen and 4,000 warriors attacked Forbes at Bembesi, about 30 miles (48 km) north-east of Bulawayo, but again they were no match for the crushing firepower of the major's Maxims: about 2,500 more Matabele were killed. Lobengula fled Bulawayo as soon as he heard the news from Bembesi; in keeping with traditional custom, he and his subjects torched the royal town as they went. In the resultant conflagration, the city's large store of ivory, gold and other treasure was destroyed, and its ammunition magazine exploded. The flames were still rising when the whites marched into the settlement the next day; they set up base in the "White Man's Camp" already present, and nailed the company flag and the Union Jack to a tree. The reconstruction of Bulawayo began almost as soon as the fires were out, with a new Company-run city rising atop the ruins of Lobengula's former residence. The pursuing party was delayed by difficult routes and heavy rains, and did not catch up with Lobengula until December 3rd. Major Allan Wilson, in command of thirty-four troopers known as the Shangani Patrol, crossed the Shangani river and bivouacked close to Lobengula's quarters. In the night the river rose, and early the next morning the Matabele surrounded the Shangani Patrol, overwhelming Wilson and his followers. 31 men of the Shangani Patrol perished in the encounter, while the remaining three (American scouts Frederick Russell Burnham and Pearl "Pete" Ingram, and an Australian named Gooding) crossed the swollen river under orders from Wilson, and returned to Forbes to request reinforcements. However, Forbes' forces were unable to cross the river in time. Lobengula eventually died from smallpox on 22 or 23 January 1894. Meanwhile, the Ndebele warriors gradually succumbed to the company's superior firepower. Soon after the king’s death, the Ndebele izinDuna submitted to the British South Africa Company. Charges were later made in the British House of Commons against the company, accusing them of having provoked the Ndebele in order to secure their territory. However, after enquiry the company was exonerated from the charge by Lord Ripon, the Colonial Secretary. In every step taken by the company, the guiding hand was that of Cecil Rhodes, a fact which received recognition when the company's territory officially received the name "Rhodesia" on May 3rd, 1895. During this year there was great activity in exploiting Matabeleland, with "Stands" or plots being sold at extraordinary prices in Bulawayo. Within nine months the rebuilt town of Bulawayo had a population of 1,900 colonials with over 2,000 more prospectors in the various goldfields. A new company, the African Transcontinental Company, was founded under the auspices of Col. Frank Rhodes, brother of Cecil, with the ultimate purpose of connecting the Cape with Cairo. The railway from Cape Town passed Mafeking, and approached the Rhodesian frontier, reaching Bulawayo in 1897. The east coast line to connect Salisbury (now Harare) with Beira, Mozambique (then Portuguese East Africa Colony) was completed in 1899. ↑ Knight-Bruce, George Wyndham (1892). Journals of the Mashonaland Mission 1888 to 1892. Society for the Propagation of the Gospel in Foreign Parts.